Seven miles off the coast of Venezuela, on the tiny Caribbean island of Trinidad, I’m about to come face to face with two dozen swirling, shrieking guardians of the dead. Likened to devils by the ancient Amerindians of South America, these sentinels of the afterlife are actually rare cave-dwelling birds that nest like bats and look like ravens with fiery red eyes. The souls of the departed were said to dwell in the recesses of their subterranean lair. I’ve hiked through a sweltering rainforest to find these devil birds, and I can hear them before I see them. They scream and flutter just out of sight, flapping their wings and circling the interior of this place called Aripo Cave as if to warn me—keep out. It’s taken me the better part of a day to reach the cave, though, and I’m not about to stop now. My guide, a brawny local from the Trinidad-based eco-outfitter The Pathmaster, urges me forward, down the slick, jaw-like rocks of the cave mouth. Soon I’m on my hands and knees, and then I’m crawling on my stomach across a narrow underground ledge for a better look. As my eyes adjust to the darkness, I see them, and I understand why the Amerindians both feared and revered them. They are hideous and loud, but compelling in their strangeness. “Time to go,” urges my guide, who leads me back toward sunlight and then on to a tiny stream, where I scrub guano from my hands and feet. The return trip to Port-of-Spain, Trinidad’s capital city and my home base for this eco-adventure, will be a long and tiring one, but my spirits are buoyed. I’ve seen nature at its most unusual, and gained an insight into the belief system of a culture long since forgotten by most of the world. Of British descent, but born and raised in Rhodesia (now Zimbabwe), Whitwell spent 18 years traveling around the tropics as a research scientist before coming to Trinidad to work in ecotourism. He’s set up The Pathmaster to cater to ecotourists interested in “active nature travel,” and he employs several local guides who specialize in different ways of interpreting the world around them. 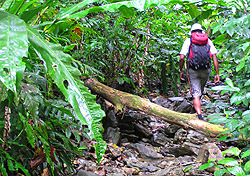 One guide, a shaman named Cristo, describes the rainforest as his “library” and points out unique local flora used for medicinal purposes by the island’s indigenous population. Whitwell, on the other hand, is the “bug man” and themes his trips around his knowledge of tropical insects. Pathmaster tours feature an unusually rich level of environmental, biological, and cultural information, and it’s hard to think of a better place for these details than Trinidad. While short on the beaches you typically associate with the Caribbean, Trinidad has a rugged, Lost World-like interior that calls to mind the jungles of South America. Geographically, too, the island is situated closer to Venezuela than to its sister island, Tobago. The rugged mountains in Trinidad’s Northern Range are a continuation of the Andes that dominate the mainland. Trinidad is outside the hurricane belt, but it is still subject to the typical wet and dry seasons of the Caribbean. The high season for tourism roughly corresponds to the colder months in North America, or mid-December to mid-April. This is also the dry season, when temperatures are mild and the air less humid. Prices tend to be higher, however, because demand for flights and accommodations is greater. The wet season, mid-April to mid-December, sees more rainfall and cooler temperatures. The extra rain, however, helps greatly if you’re coming to Trinidad for, say, an inland kayaking trip. It’s also fine for trips centered mostly on hiking and rainforest exploration, like mine. A perfect in-between time to visit is mid-September to mid-October, the “short dry period” called Petit Careme. Trinidad, particularly its capital city, Port-of-Spain, has a reputation for crime. This is not to be taken lightly, but it shouldn’t be an overriding concern, either. Common sense measures like avoiding seedy areas, traveling in a group, and not calling attention to yourself with flashy clothing or jewelry are usually a sufficient deterrent. The Trinidadians I met on my trip were all friendly and happy to help out. When in doubt, rely on the expertise of local tour operators to help make sensible travel arrangements. The Pathmaster is an excellent resource for accommodations and dining suggestions, and can customize everything from a day trip to an entire vacation experience—including transportation—to your needs and comfort level. The Trinidad and Tobago Tourism Development Company’s website offers a comprehensive list of other tour operators as well.